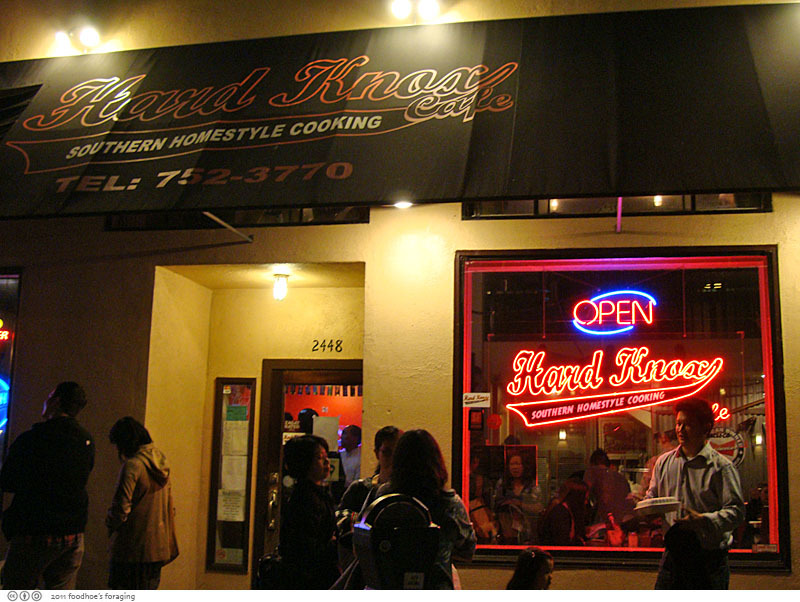 A group of us met at the Hard Knox Cafe on Clement Street last week to celebrate our friend JT’s birthday. 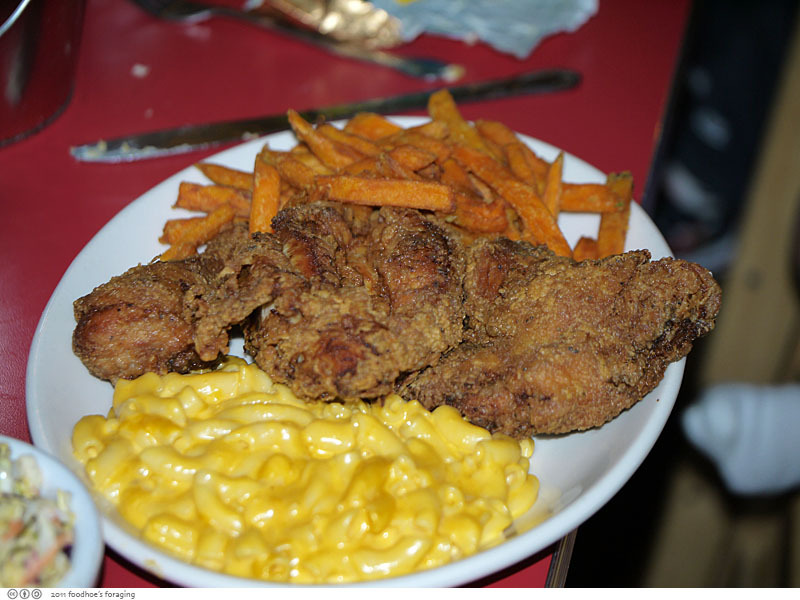 I’ve been to the Potrero Hill location and posted about it here and specifically about the fried chicken here. The Clement Street location is larger and has a second floor where we were seated at a long table to fit our our large-ish group. The lighting was not so good upstairs, but with the kickback vibe in our private dining area I felt uninhibited enough to use the flash on my camera… The decor is funky roadside diner, with a bit of beach shack kitsch thrown in. We hadn’t seen each other in ages, so we had lots of catching up to do. I swear, babies and kids grow like weeds between visits! We started with a variety of appetizers, the BBQ Shrimp ($11) was not exactly what I pictured. 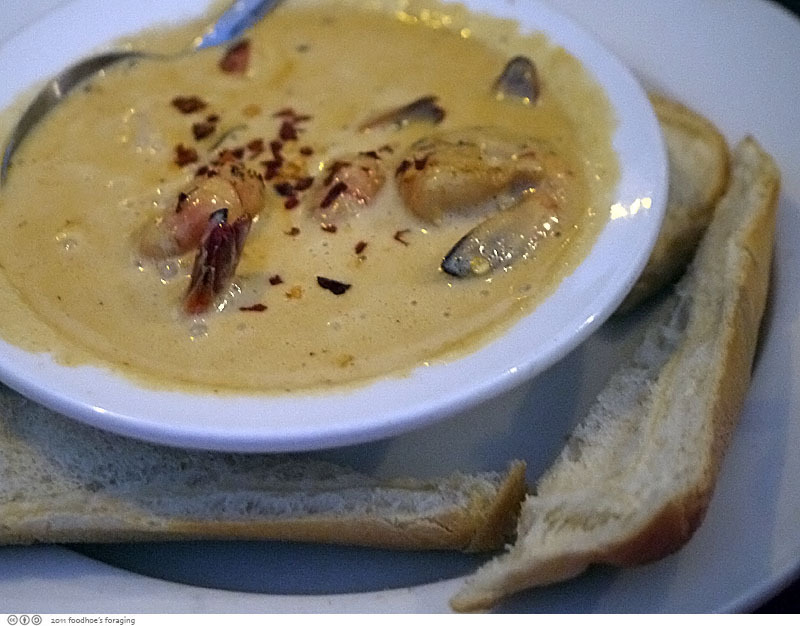 The half dozen tiger prawns were served in a spicy Cajun sauce that looked like chowder, surrounded by toasted baguette. The crusty bread was very good dunked into the rich and creamy sauce. We gobbled up the Spicy Wings, which were coated in a crunchy batter that sealed in the juices and then coated with a lip smacking sauce that made my lips burn with spicy heat. 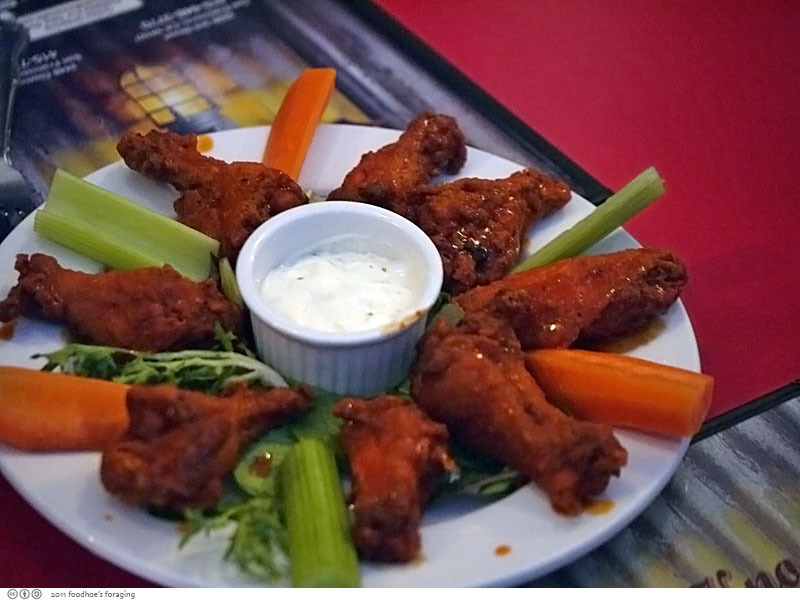 The crisp celery and carrot sticks dipped into the cool blue cheese dressing were an excellent accompaniment. 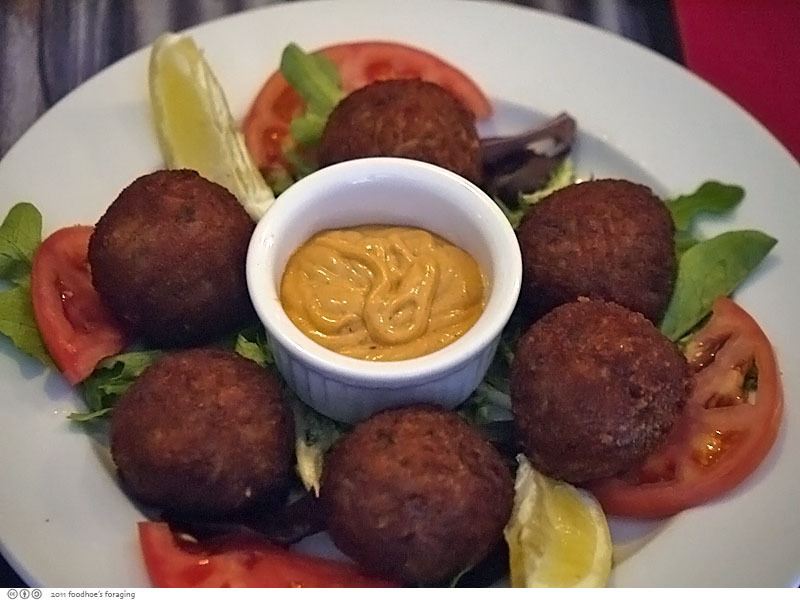 The Cajun Shrimp Balls ($8) were flavorful spheres filled with chunks of shrimp, corn, rice, and Cajun seasoning dipped in batter and fried until crisp and served with spicy aioli. A delightful twist on the Italian arancini. 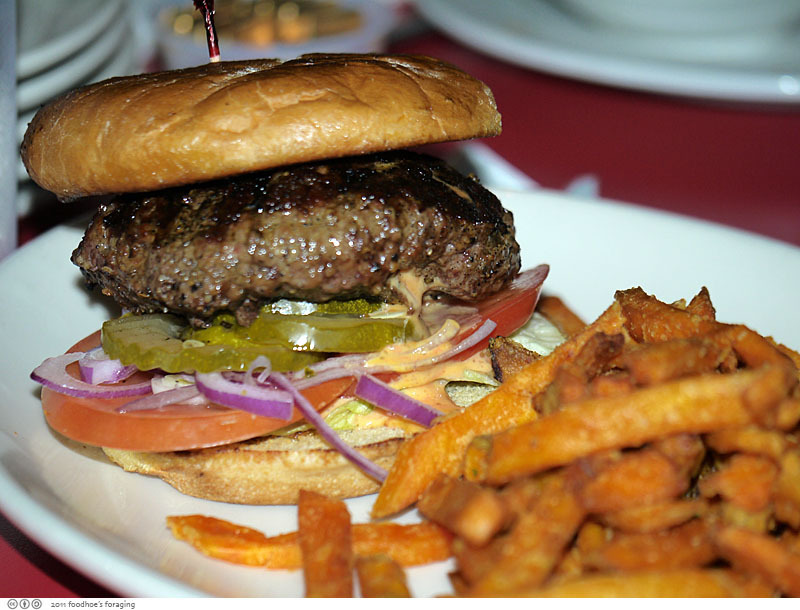 I was excited when I saw the Juicy Lucy ($8) on the menu. The juicy lucy is a midwestern invention (that I enjoyed here) that is slowly making its way out west. 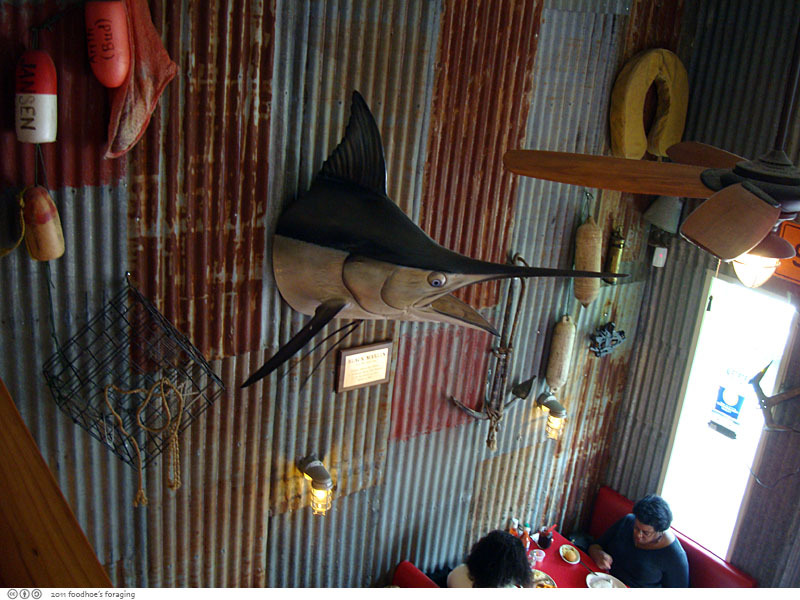 I read that Maverick has added an upscale version of it to their menu, must go check that out soon. 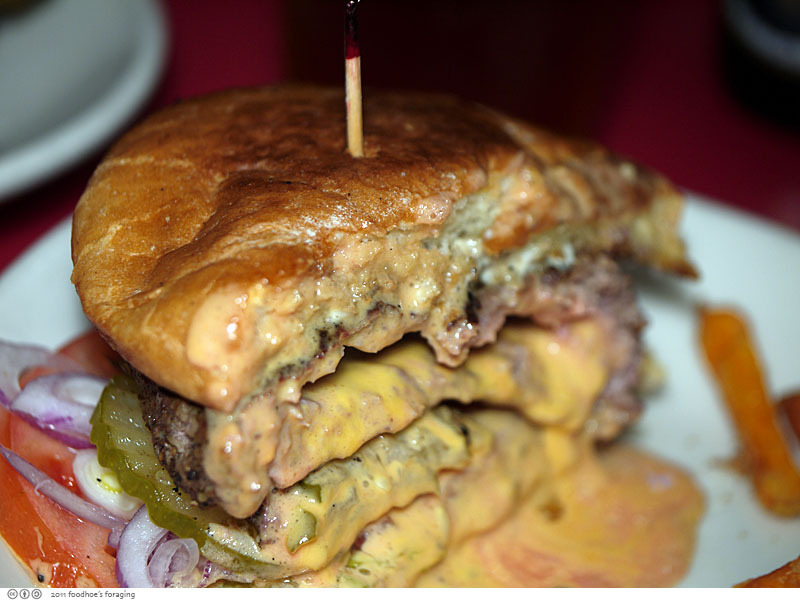 Anyways, the Juicy Lucy served at Hardknox was a hefty half-pound burger, well actually it’s two quarter pound patties sealed around the edges and filled with oozing melted American cheese in the center, topped with mayo, mustard, lettuce, tomatoes, onions, and pickles. Can you see the little bit of cheese dribbling out? I cut the Juicy Lucy in half and the cheese gushed out, forming a gooey puddle that I just had to mop up with the rest of the burger. 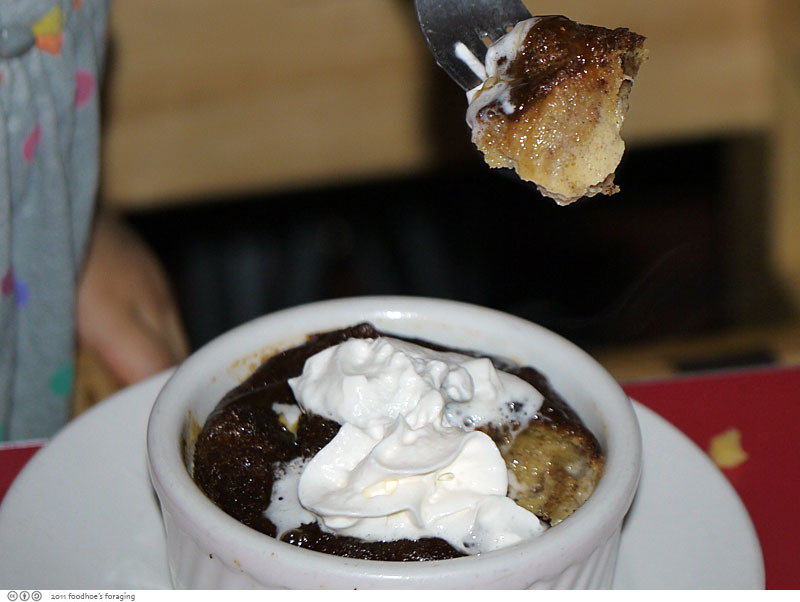 Very decadent, kind of like dipping your burger in cheeseburger sauce… so good! I had sweet potato fries on the side. I have no good explanation why I also ordered Chicken ‘n Waffle ($10), but I did. Of course after the juicy lucy, I ended up taking it to go and enjoyed it for breakfast the next day. The waffle perked up nicely in the oven. 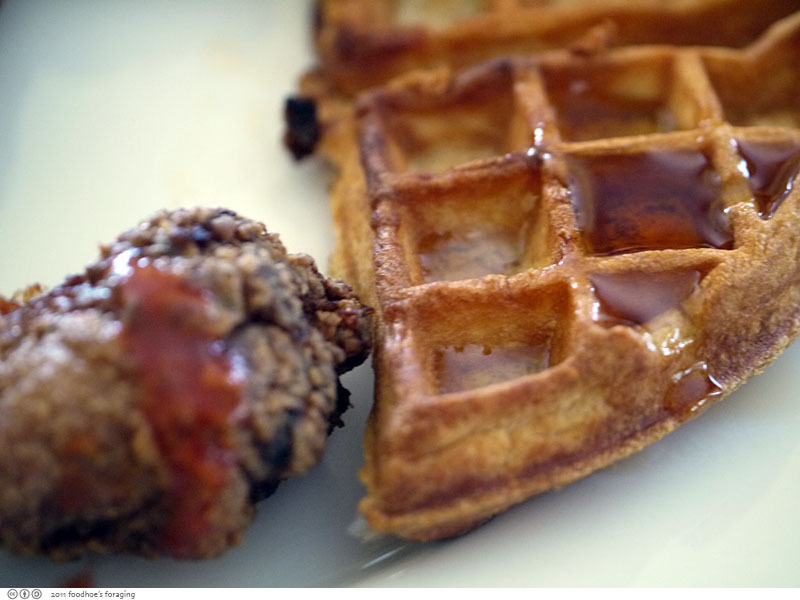 The combination of buttery waffle drizzled with sticky maple syrup along with the fried chicken with hotsauce is uncannily good for breakfast. 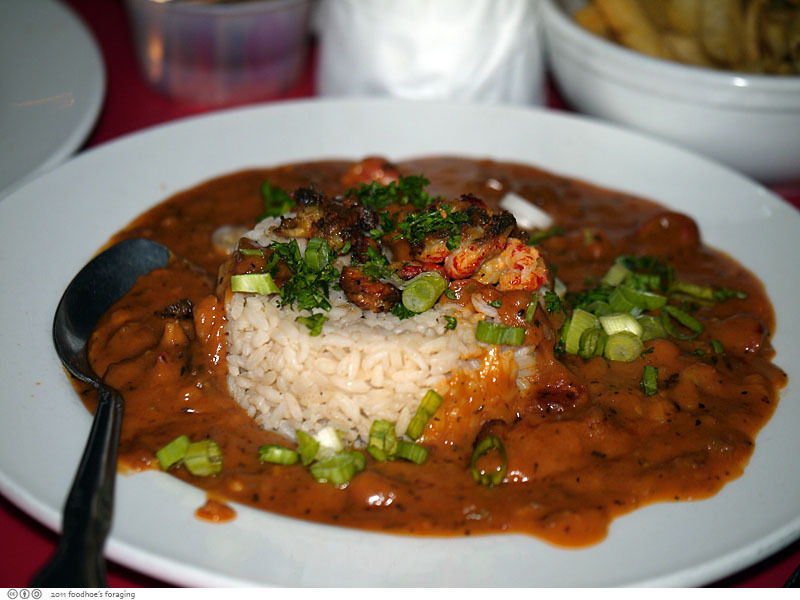 Daisy had the Crawfish Étouffée ($12), smothered in a thick, spicy tomato based sauce served over rice. 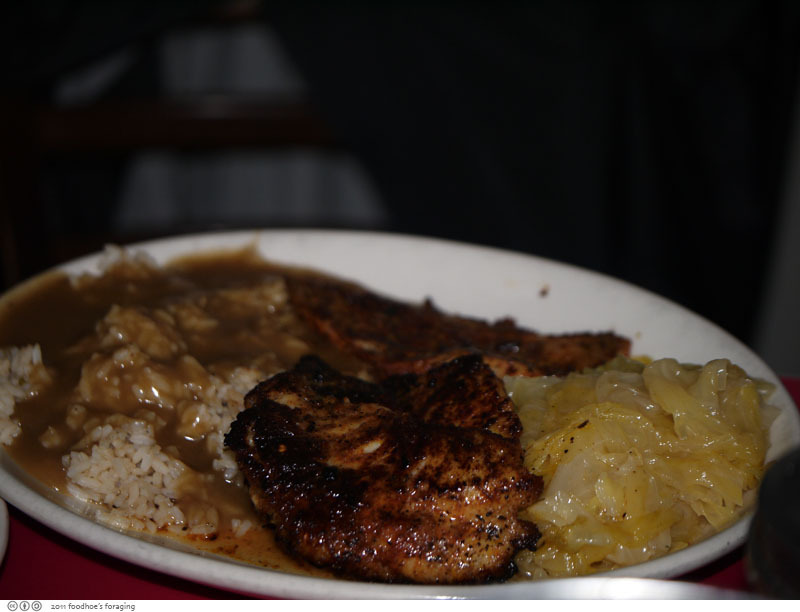 She ordered it instead of fried chicken because it was lent and urged me to share the thick and delicious stew. 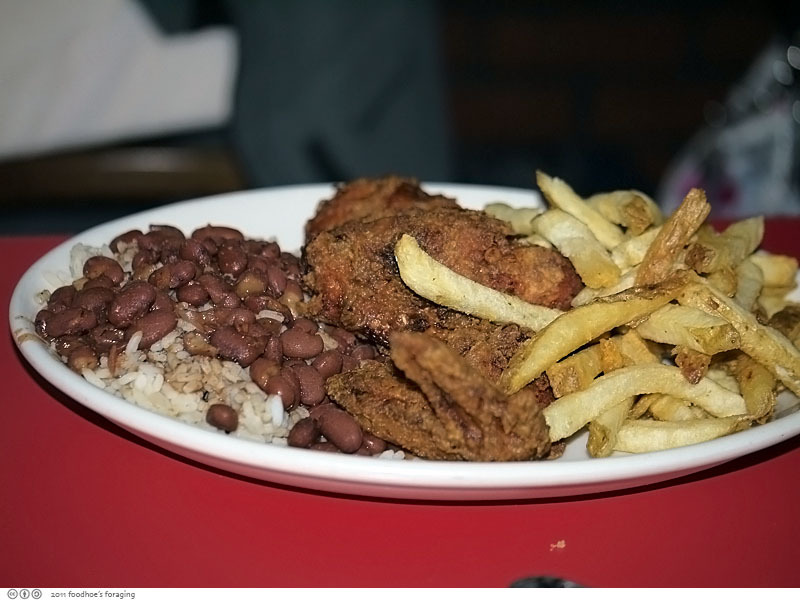 Here it is with regular fries and a side of rice and beans. We were all fairly stuffed by this point, but since we were celebrating JT’s bday, we serenaded her with a lively Bread Pudding ($6). Sweet, sticky, gooey and crunchy happy birthday wishes to JT. I’m drooling! The rich burger is so tempting. Looks like the Juicy Lucy lived up to its name! Your flash photos didn’t turn out as washed out, you must have a good flash on your camera that’s not as blinding. I need to try a Juicy Lucy. Sounds totally up my alley. 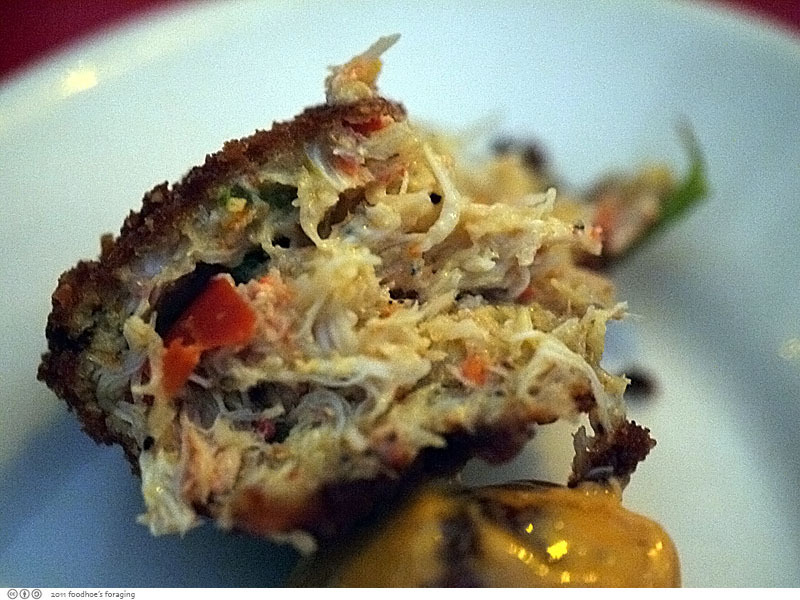 I’ve really enjoyed your writing about some great food spots in the city! In about a month I will be launching a website focused on great food dishes here in SF, and would love to get your thoughts on it…and if you are interested, potentially get your help with some of the writing. Shoot me an email at marc [at] heardabout [dot] com and I’ll tell you more about it! The Juicy Lucy indeed looks juicy!! Looks like a lot of new items at Hard Knox, I must pay a revisit! Love how you ordered two plates! Single guy, you would have laughed… I held up my napkin over the flash so it wouldn’t be so blindingly bright. gastronomer, I can’t wait to see what SoCal has to offer! usually for me, the only thing better than a cheese volcano is a chocolate volcano. i’m rethinking things now, thanks to your luuuuuuuucy.